Don’t see a bedroom with small space as a big trouble. If you can treat it well, you can save more space as well as turning it into a super cozy bedroom that can ensure your sweet dream and comfort. You can even invite your bestie to sleep over without worrying about the space. If you wanna know how to impress yourself – or maybe your friend – with your tiny bedroom, check out this video since you’re gonna find 10 bedroom sets idea for small space by simphome.com. 10. No Closet? No Problem! Living in a small apartment makes you unable to furnish your bedroom with many pieces of furniture. Not even a closet which plays an essential role in managing the clutter in your bedroom. Well, it’s not the end of the world, though. No closet? No problem! You can still have other storage ideas which can save more space and – of course – be way more efficient. 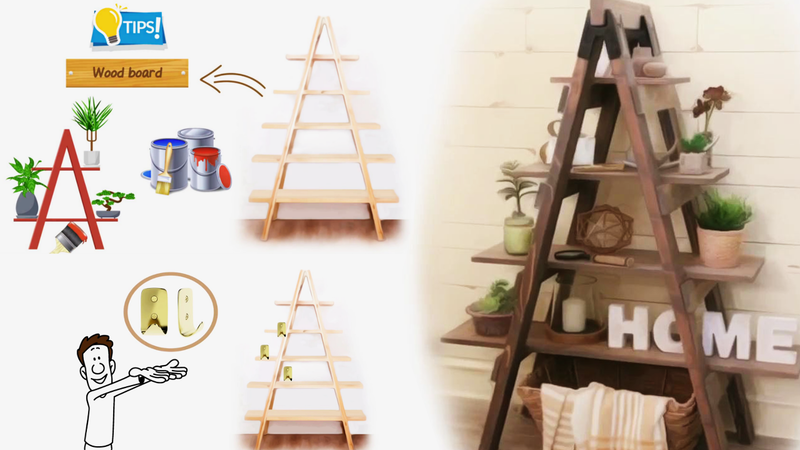 You can begin to shop around your house and find anything that can be a potential storage solution like unused step ladders that you can turn into a few racks and a wardrobe, and a wood branch that you can use to hang your clothes. Or, if you need to blow off steam as well as adding a storage solution without taking up a lot of space, you can make some drawers or a hidden cupboard under your bed. You might hear some arguments about not shoving your bed against the wall when you are dealing with a limited space. Well, nothing could be further from the truth. Investing in a twin bed and shoving it against the wall is your greatest bet when it comes to an undersized bedroom. By doing this, you can have more space in the middle so you can move through or invite your friend to binge Netflix in it. Another idea that you can try to make your bedroom appear to be larger is by keeping the floor space clean. You can do it by making some wall mounted racks shelves where you can store your books. Your kids need a room where they can blow off steam and explore their imagination. Unfortunately, your small apartment doesn’t allow it to come true. Why don’t you just turn your kids’ bedroom into a craft room? By investing in a loft bed, you’ll be able to do various kinds of things underneath such as making a craft room, game room, or even reading room. Again, a loft bed can save the day. You can even have a wardrobe and some bookshelves in an extremely limited-space bedroom, thanks to the loft bed. This bedroom is tiny. However, everything seems to be organized well. Two wardrobes and several drawers stand nicely to support the loft bed. Some bookshelves can be found under and over the bed, giving you an abundance of space to store your books and knick-knacks. Keeping the room simple by repeating the order of a few colors can be much better than throwing any color carelessly to create a haphazard look because sometimes less is more. This grey bedroom look awesome with the DIY loft bed. The loft bed is mounted from the wall. Two chains are used as the additional supports for the bed to stay steady. Two wall mounted racks hang near the bed so you can reach them easily. Under the bed is a desk that you can use to work on your assignment or pull an all-nighter. The DIY sofa is fantastic because it is made out of wooden crates. Some space is available beneath the sofa to keep your storage boxes out of your sight. Another way to make a temporary space in your house is by making a hidden bed. This elevated living room allows you to maintain a relaxed ambiance when talking to your friends while enjoying the scenery of the neighborhood. But when your friends are not around, you can pull the bed under the living room out so you can lay your back on it and sleep. Now you can get a comfortable bed without compromising your cozy living room. Isn’t that great? If you live in a tiny apartment, you know how precious every square inch to you. You don’t have enough space to put various pieces of furniture at once. Therefore, you need to make some furniture float just like a loft bed. Placing your loft bed above the entryway allows you to put more furniture such as a dining table, wardrobe, and others. This loft bed, for example, floats over the kitchen, providing ample space for you to move through. The loft bed is installed from wall to wall so it has enough space for several drawers or even a TV set. The best way to get more floor space is by removing your bed when it isn’t needed. But it will be arduous and hectic to lift and hide it somewhere all the time. If that’s the case, you can give this retractable bed a shot. During the day time, the bed can be retracted so it can be as close to the ceiling as possible. As a result, you can get a spacious living room that you can even use to play Rollerblade. It’s not meant to be a sidewalk, though. The wooden headboard is actually a fold-able mounted table. You can just unfold it and you’ll get an extra table and have a mini table bar. And when it’s late enough, you can pull the bed down so you can sleep comfortably. Who would have guessed this tiny apartment can turn into a fabulous one? It has a cozy living room, kitchen, bathroom, and bedroom despite the extra small size. The key of getting this look while getting by the small space is by placing the bedroom over the kitchen and bathroom. by doing this, you can get anything you need without cramming your apartment. Having a luxurious walk-in-closet in a small house? Why not? You can still have a walk-in-closet that you’ve been longing for if you put a loft bed on it. As a bonus, that bulky bed won’t gobble up the remaining space that you can actually use to invite some friends to have a small party. Those are 10 bedroom set ideas that fit your small space very well. So, don’t think that you’re unfortunate just because you live in a house with limited space because a small house can have a big chance to look great.